547 p., 15,6 x 20,9 cm. Nachschriften von August Friedrich Klüpfel. Edited, introduced and annotated by Michael Franz and Ernst-Otto Onnasch. Johann Friedrich Flatt (1759–1821) was the first professor of philosophy to hold lectures on Kant’s critical philosophy in Tübingen. It has been proven that these lectures were attended by Hegel, Hölderlin and Schelling. In them, Flatt endeavored to adopt a benevolently neutral attitude towards the ›Kritik der reinen Vernunft‹ (Critique of Pure Reason). 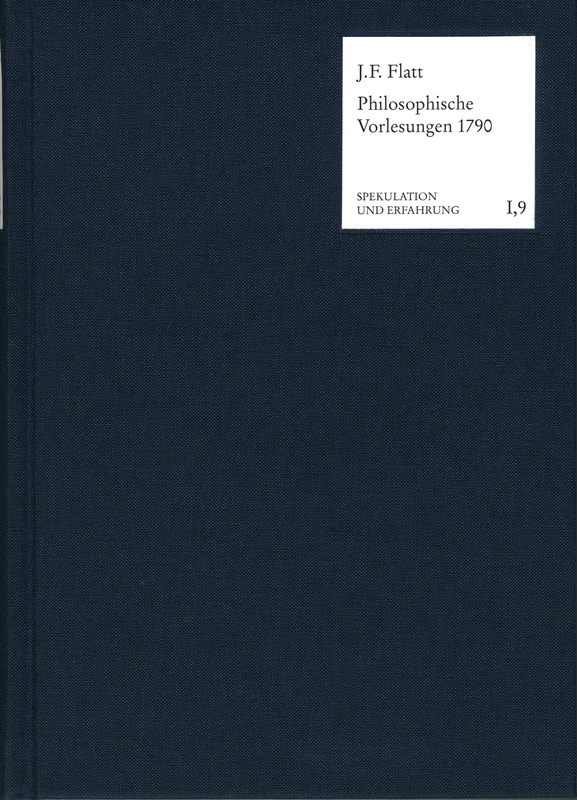 Thus the transcripts published in this work will be able to alter the widespread opinion, prevalent for a long time, that Flatt was nothing more than an »opponent of Kant and an apologist of Tübingen orthodoxy.« The transcripts of the lectures on metaphysics and psychology were written by Hegel’s and Hölderlin’s classmate August Friedrich Klüpfel and have been provided with introductions and commentaries.